❶Portable solar charger 10,000mAh rechargeable grade A Li-Polymer cells, high capacity no pressure on charging iPhone 6 3+ , iPhone 7 Plus/Galaxy S7 2+, power bank equipped with a compact solar panel charged via solar power under emergency (Green light will flash under sunshine), recommend fully charged by USB via PC/AC adapter. ❷Dual USB 1.0A/2.1A Max charging output allows two phones charging one time , and we suggesting 1A port for iPhone, android phones, 2.1A high-speed for iPad, android tablet, games fun never ends. 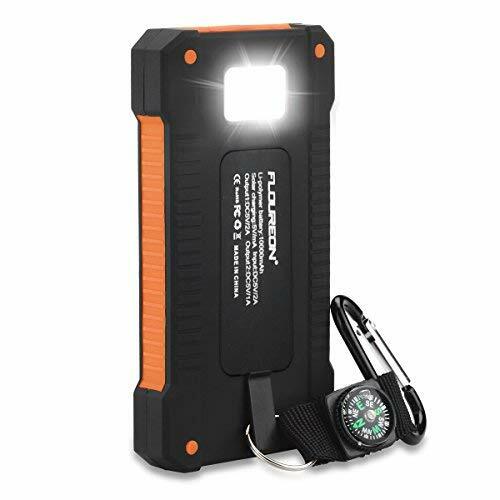 ❸Strong/Strobe/SOS LED emergency light and hanger with an extra compass make it very convenient for finding direction - Ultra compact charger 5.4x3.0x0.75 inch, 0.2kg, on the go! ❹Smart 5-LED indicators keep reminding you the amout of power left and how much it being charging, auto light up when phone connected and light off when phone fullly charged. ❺[WARRANTY] - 60 DAYS MONEY BACK & 18 MONTHS EXCHANGE - We guarantee you\'ll love this FLOUREON Solar Charger Power Bank and if you aren\'t absolutely satisfied, returned it within 60 days for a full refund, no questions asked.